BALTIMORE (Stockpickr) -- Earnings season is in full force this week -- and the early results reveal that it's been another overwhelmingly bullish quarter for stock fundamentals. Of the 285 S&P 500 components that have already reported earnings, nearly 80% have beaten Wall Street's estimates. There are a couple of important takeaways from the data so far. First, the average earnings surprise for the fourth quarter is coming in at 5.4%. Only a single quarter in the last two years has come in higher. And second, the price reactions have been overwhelmingly positive. That's not always the case, particularly in overextended markets; the fact that investors are stepping in to buy earnings performers sets the stage for this rally to keep hitting new highs in 2015. To take full advantage of that bullish market positioning, we're turning to the charts for a technical look at five huge blue chip names sending buy signals in February. First, a little on the technical toolbox we're using here. Technicals are a study of the market itself. Since the market is ultimately the only mechanism that determines a stock's price, technical analysis is a valuable tool even in the roughest of trading conditions. Technical charts are used every day by proprietary trading floors, Wall Street's biggest financial firms, and individual investors to get an edge on the market. And research shows that skilled technical traders can bank gains as much as 90% of the time. Every week, I take an in-depth look at big names that are telling important technical stories. Here's this week's look at five big stocks to trade this week. To kick things off, it makes sense to get some market context. We'll do that with our favorite investible proxy for the stock market: the SPDR S&P 500 ETF (SPY - Get Report) . This $186 billion exchange-traded fund tracks the ebb and flow of the big S&P 500 index, and it's been providing traders with a "buy-the-dips market" in recent years. The good news is that we're still in it -- and as shares dip to start 2015, we're coming up on another buying opportunity. 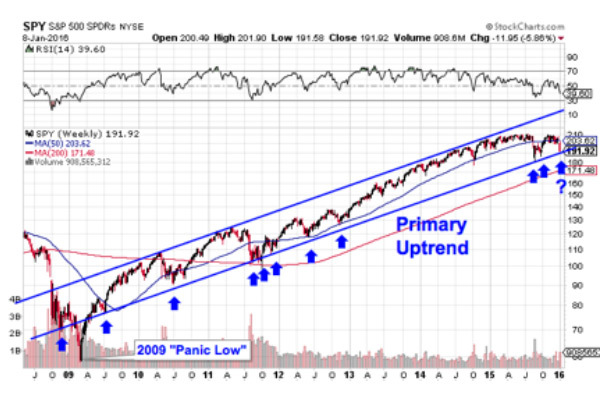 The chart above takes a weekly look at SPY over the last four years. The good news is that you don't need to be an expert technical trader to figure out what's been going on in shares of SPY. Price action in this big ETF has been as simple as it gets. SPY is bouncing in a well-defined price channel, which means that every test of trend line support has been a low-risk, high-reward opportunity to buy stocks. With the broad market correcting at the start of 2015, we're coming up on another major buying opportunity. The 50-week moving average has been a stellar proxy for support over the course of this multi-year stock rally. As long as that line in the sand remains intact, so is this intermediate-term bull market. It makes sense to buy the next bounce off of support in SPY. Zoom in a bit, and we're seeing the exact same price setup in shares of PepsiCo (PEP - Get Report) . 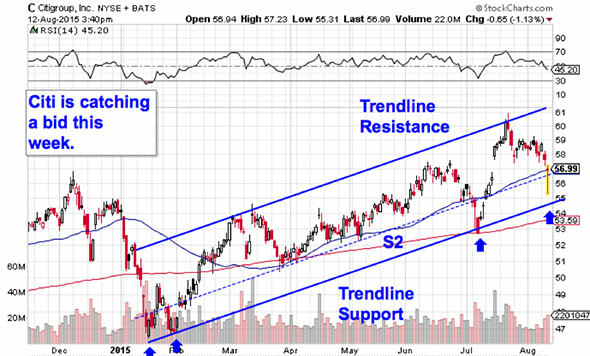 Just like SPY, Pepsi has been bouncing its way higher in a well-defined uptrending channel. So far, each of the last six touches of trend line support has provided a high-probability buy signal -- and as shares bounce for a seventh time since last summer, it makes sense to buy the bounce. Waiting to buy off a support bounce makes sense for two big reasons: It’s the spot where shares have the furthest to move up before they hit resistance, and it’s the spot where the risk is the least (because shares have the least room to move lower before you know you’re wrong). Remember, all trend lines do eventually break, but by actually waiting for the bounce to happen first, you're ensuring PEP can actually still catch a bid along that line before you put your money on shares. Within the uptrending channel, PEP is actually forming a symmetrical triangle pattern (also known as a coil). That triangle is typically a "half-mast" pattern, which suggests that PEP could be in store for another similar-sized rally from here. Considering the fact that shares are up 20% in the last 12 months, that's a good piece of extra evidence that buying PEP looks attractive here. Look out for earnings on Feb. 11. On the other hand, PetroChina (PTR - Get Report) hasn't been in rally mode lately. In fact, this stock has been selling off in recent months along with the rest of the energy sector. All told, PTR is down around 24% from its September highs, but that could be about to change. That's because PetroChina is currently forming an ascending triangle pattern, a bullish price setup that's formed by horizontal resistance above shares and uptrending support to the downside. Basically, as PTR bounces in between those two levels, it's been getting squeezed closer to a breakout above our resistance level at $115. When that breakout happens, we've got our buy signal. Relative strength is the side indicator to watch in shares of PTR right now. While relative strength started off moving lower last fall, it actually broke that downtrend and reversed into an uptrend in late December. As long as the new uptrend in relative strength remains intact, this stock should start meaningfully outperforming the S&P. Still, it's critical to wait for shares to catch a bid above $115 before you buy. Big bank Citigroup (C - Get Report) is another mega-cap stock that's starting to look "bottomy" after selling off in recent months. For Citi, the price pattern in play right now is a double bottom, a bullish reversal setup that looks just like it sounds. The double bottom in Citigroup is formed by a pair of swing lows that bottom out at approximately the same price level -- the buy signal comes on a push above resistance at $49.50. Momentum, measured by 14-day RSI at the top of the chart, adds some extra confirmation to the move: our momentum gauge made higher lows at the same time that price was re-testing the same low-water marks on the second bottom. That's a bullish divergence that suggests buying pressure is quietly building in shares of Citigroup. If you decide to buy the $49.50 breakout in shares of Citigroup, then it makes sense to keep a protective stop just below the bottom of the pattern at $47. If that $47 line in the sand gets violated, then the pattern is broken, and you don't want to own Citi anymore. Last, but certainly not least, is TE Connectivity (TEL - Get Report) , a $27 billion electronic component maker that also happens to make my list of Rocket Stocks for this week. The good news is that the chart for TEL doesn't look half bad either. In fact, shares are signaling a big buying opportunity thanks to a breakout in February. 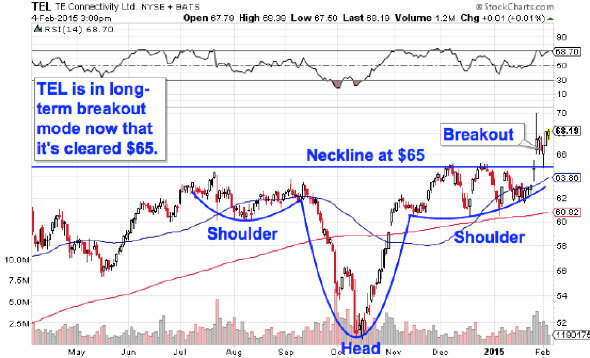 TEL spent the last six months forming a long-term inverse head and shoulders pattern. You can spot the inverse head and shoulders by looking for two swing lows that bottom out around the same level (the shoulders), separated by a bigger trough called the head; the buy signal comes on the breakout above the pattern’s “neckline” level (that was the $65 price level in TEL). 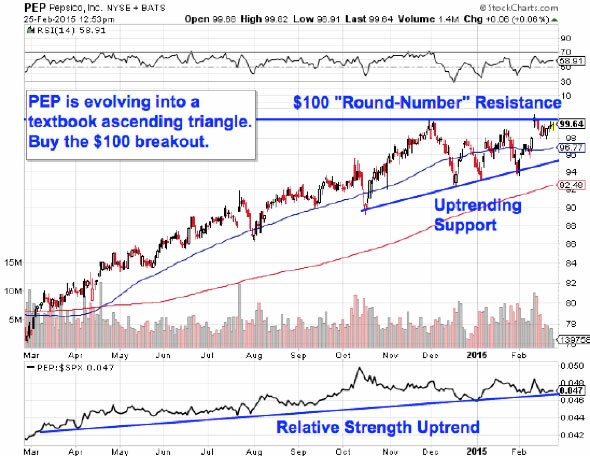 TE Connectivity confirmed its breakout above $65 last week, and it's giving traders a buying opportunity now. Because the inverse head and shoulders in TEL is long-term and deep, it comes with equally long-term and potentially lofty upside implications. The minimum measuring objective in this stock puts a price target up at $78, a 15% upside target from here. 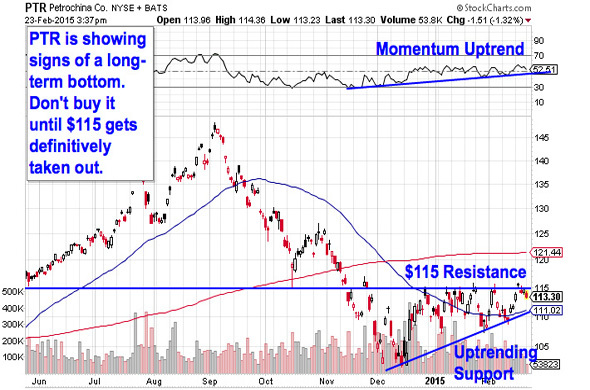 If you decide to buy TEL, I'd recommend putting a protective stop at the 200-day moving average.